With a variety of activities to choose from, the possibilities are limitless, from Theme Parks & recreation to dining & nightlife, and everything in between. Take advantage of everything Walt Disney World® Resort has to offer. Click on the helpful links below to learn more. Catch everyone’s favorite buccaneer, Captain Jack Sparrow, as he joins the crew of the Pirates of the Caribbean attraction! Plummet into dark caves and tumble over rolling waterfalls as you join in on the adventures of Bre’er Rabbit on Splash Mountain®. Enjoy new attractions and interact with characters in ways you never thought possible. Journey to the Enchanted Forest, where you can become part of Ariel’s world, dine in Beast’s Castle, join Belle for a retelling of the “tale as old as time” and explore two new royal castles. Fly to new heights as you wing your way through the skies on an awe-inspiring flight on the exhilarating Soarin’® attraction! Board a “clammobile” and follow Marlin and Dory as they chase the ever-curious clownfish in the Seas with Nemo & Friends. Dodge meteors, navigate nebulae and slingshot around the moon…without leaving Earth on Mission: SPACE®. Get revved up for an exhilarating driving experience, now designed by YOU! Lights…camera…and the stage is set for plenty of action! The glitz and glamour of Hollywood take center stage at Disney’s Hollywood Studios®. But the star is you! Take aim and ride an interactive 4-D “Toy Story” adventure like no other. It’s Toy Story Mania! ®– an attraction inspired by Disney•Pixar’s “Toy Story” films. Catch the up-and-down beat of Rock ‘n’ Roller Coaster® Starring Aerosmith in a twistin’, turnin’, loopin’ limo ride that is sure to get your adrenaline jamming’. The power of the Force and the magic of Disney have combined again to bring you Star Tours®–The Adventures Continue! With new destinations featuring out-of-this-galaxy characters like C-3PO, R2-D2 and Darth Vader, you’ll never know where the Force might take you! And with each adventure, you can see the Star Wars™ universe in an all-new way…in 3-D! With so much to see and do, you just may need an encore! ©Disney/Lucasfilm Ltd & ©2011 Lucasfilm Ltd. & TM. Experience a high-speed train trek forward and backward through the treacherous Himalayan unknown, where the dreaded Yeti lurks on Expedition Everest–Legend of the Forbidden Mountain®. Explore over 100 acres of African Savannah on Kilimanjaro Safaris® as you become surrounded by free-roaming wildlife in their natural habitat. Dive right into the heart, humor and characters of Finding Nemo with the musical version of the award-winning Disney•Pixar animated film. This on-stage extravaganza is is a visually-inventive, original musical, merging puppetry with live performances. The world-famous water parks of Walt Disney World® Resort offer you the opportunity to cool off and chill out surrounded in unparalleled magic and fun. At Disney’s Blizzard Beach Water Park, the legend of Florida’s first ski resort comes to life. Brave “black diamond”-intensity thrills like the 120-foot vertical free-falling Summit Plummet, America’s tallest water slide, or the world’s longest family raft ride, Teamboat Springs. Jump into a tropical paradise at Disney’s Typhoon Lagoon Water Park, home to the gravity-defying uphill water coaster Crush ‘n’ Gusher. Bask in the Florida sun as you tube down Castaway Creek, and snorkel through an underwater reef among real sharks. For thrills or chills, come hit the waves where imagination reigns! World-class restaurants, dazzling entertainment and unique shops line the waterfront at Disney Springs™. 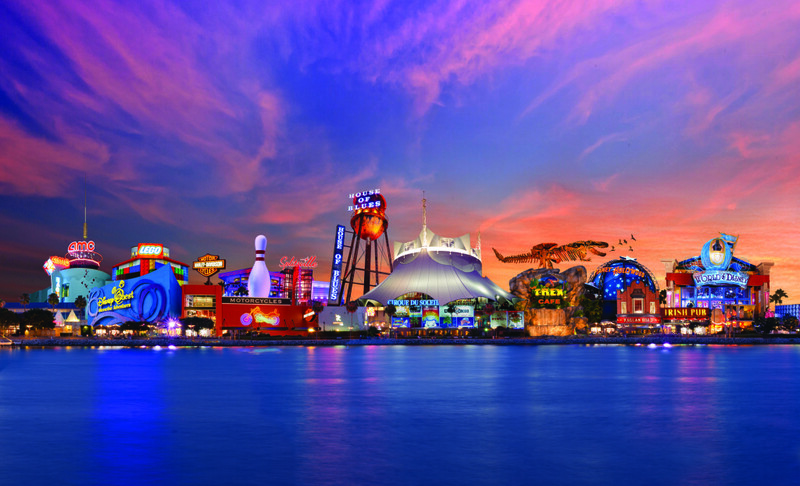 Shop in the world’s largest Disney store, dine amid life-size prehistoric creatures, bowl a game at a 30-lane alley and more. For additional helpful information in planning your trip to Walt Disney World® Resort, click on the helpful links below.